June 1st, 2015 chemical manufacturers, importers, employers and distributors were required to provide a common approach to classifying chemicals and communicating hazard information on labels and safety data sheets. According to OSHA, “Chemical manufacturers and importers must provide a label that includes a signal word, pictogram, hazard statement, and precautionary statement for each hazard class and category”. 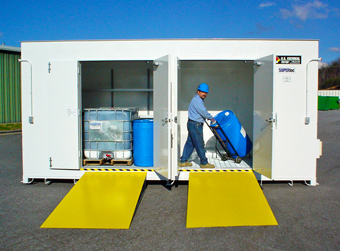 This change provides workers with increased protection from chemical hazards, while reducing trade barriers and improving productivity for companies that handle, store and or use hazmat. Labels: Chemical manufacturers and importers are required to provide a label that includes a harmonized signal word, pictogram and a hazard statement for each hazard category and class. Other precautionary statements must be included. Safety Data Sheets: Now have a specified 16-section format. Hazard Classification: Illustrates specific criteria for classification of physical hazards and health, as well as classification of mixtures. Hazard Classification: is the information of what dangers or hazards a specific chemical substance can cause, including the chemical’s class and category. This hazard classification will be standardized across all chemical substances. Hazard Labels: The new OSHA hazard communication standards require labels to contain a pictogram which shall illustrate the specific hazard that the chemical is associated with, verbiage that assigns a hazardous class and category to each chemical, a statement that demonstrates how the chemical should be handled, and specific words that classify the level of severity that the hazard contains. Safety Data Sheets: The new formatting of these sheets will follow a standardized 16 section design, illustrating the chemical’s information. For a free chemical storage consultation call 1-800-233-1480 or contact us online. 1. OSHA. Hazard Communication; Fact Sheet. June 2015. 2. OSHA.gov. Hazard Communication Compliance; Small Entity Compliance. May 2014. 3. MSDS Online. GHS 101: Labels; GHS: Hazard Communication Labeling.